Abby the Librarian: The Adventures of Ook and Gluk + Giveaway! The Adventures of Ook and Gluk: King-Fu Cavemen from the Future by Dav Pilkey. (Grades 2-5.) Scholastic, August 2010. 176 pages. Review copy provided by publisher. Ook and Gluk (rhymes with 'duck') have been having fun together since they were in cave diapers - going over waterfalls on logs, running from Mog-Mog the dinosaur, and making life miserable for Big Chief Goppernopper, the ruler of Caveland. When an evil corporation from the future comes back to harvest resources and enslave the cavepeople, can Ook and Gluk save the day? Step 1: TAKE OFF YOUR GROWNUP HAT. Step 2: Enjoy this wacky, hilarious, irreverent book. Laugh like you did when you were a kid. Revel in the ridiculousness. Step 3: Hand it to the kids at your library and tell them, "This book is soooo funny!" I admit that when I first opened this book, I still had my grownup hat on. I read Captain Underpants in grad school, but that was years ago, and I kept saying, "Really? This book is all misspelled! We can't let kids read this!" Yeah, then I made myself take off my grownup hat. And what I found was a hysterical romp through time and back. I mean, this book's got time-travel, dinosaurs, kung-fu, pleeenty of potty humor, and two kids who end up saving the day by beating down The Man. What more could a young reader want? I have proof from the trenches, too. The other day, a boy came in asking for "the new Captain Underpants". I explained that there weren't any new Captain Underpants books, but the same author had this new series and I pulled it off the shelving cart for him. Holy cats. You would have thought I was, I dunno, Santa Claus or The Beatles or something. He was so happy to have this book in his hands. Okay, it's not for all readers. Kids looking for sensitive stories with nuanced characters should probably look elsewhere. And it's definitely not for all parents. It's not great literature, but it's a mighty enjoyable read and anything that gets kids excited about reading is a-okay with me. Check out more reviews at Oh Boy, Books, Back to Books, Brimful Curiosities, Literate Lives, and A Year of Reading. And while you're checking out things, check out the book's website with lots of neat activities and a video about the creation of Ook and Gluk. 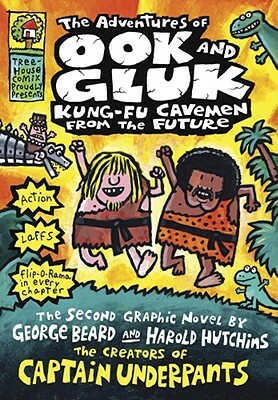 The Adventures of Ook and Gluk: Kung-Fu Cavemen from the Future is on shelves now! And if you're just dying to read it, why not enter this fabulous giveaway from Scholastic? Just fill out the following form by the end of Sunday, December 5 and on Monday, December 6 I will use the random number generator to pick one lucky winner! These books will make great gifts for the kids in your life. Enter today!